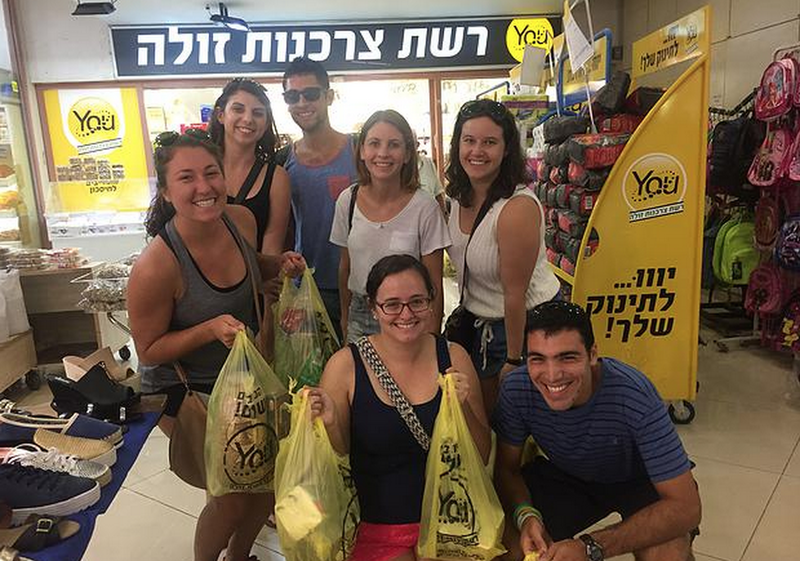 This summer, Yahel organized a service learning program in collaboration with Onward Israel and Repair the World for college students from all over the US. Originally based in Be’er Sheva, the group was relocated to Yerucham in July during the operation in Israel/Gaza. 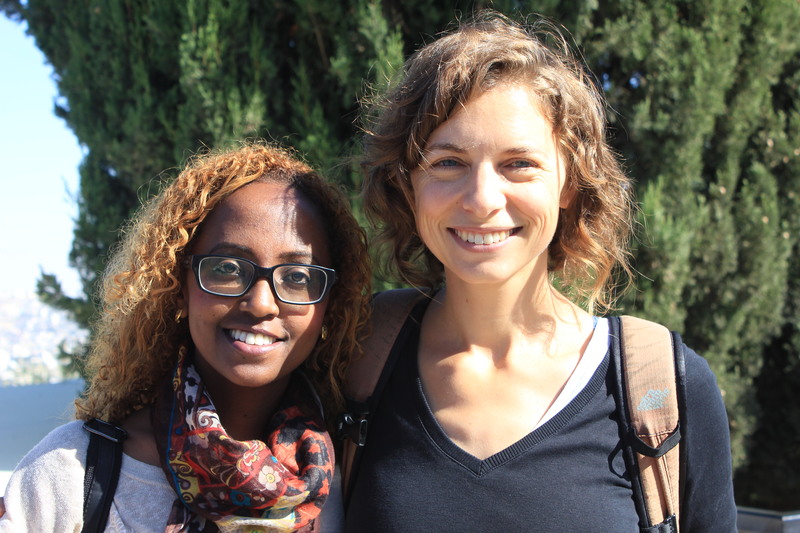 Below is an interview with Hadara, a local business owner in Yerucham, which was conducted by two of this year’s participants, Jessie Leider and Molly Weilbacher. As we sit down to write, we can’t believe it’s our last day in Yerucham after a summer of unexpected adventure throughout Israel. What started as a service learning initiative based in Be’er Sheva quickly turned into an unforeseen journey with many transitions. Now, five and a half weeks later, we’ve come to feel at home in the small and unique desert town of Yerucham, located just half an hour east of Be’er Sheva. The transition from the “big” city of Be’er Sheva was initially confusing, but as we adjusted to the slower paced life in a town of five restaurants and one main road, we discovered the beauty that lies within this tightly knit community. As we settled in and tried to find our place in Yerucham, we found ourselves frequenting the homey and only café to be found in town. Owned by local family entrepreneur and baker Hadara, Zman Ichut Café and Patisserie quickly became our home base. Not only is the food simple and fresh; Hadara and her children have created a warm, communal, and necessary environment for this small town. 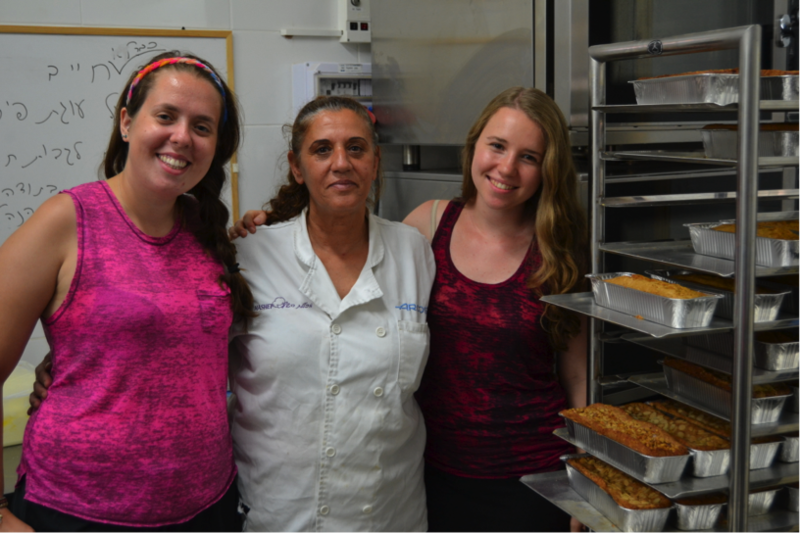 Ultimately, after what was perhaps our tenth meal there in just a few days, we discovered that she and her family had taken it upon themselves to bake and send thousands of cookies and cakes to IDF soldiers at their bases and in hospitals. Having felt strangely disconnected from the war, we jumped at the opportunity to help in a hands-on, collective way. 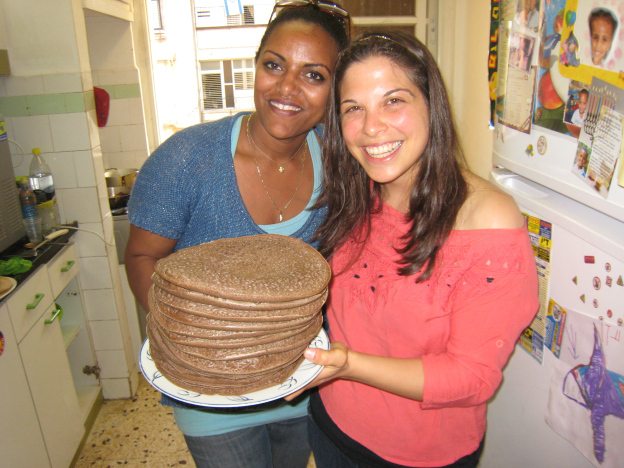 Hadara welcomed us to join her, and soon we were side-by-side, baking and learning from her each day. How long have you been in Yerucham? Two years. But I lived before in Yerucham. I left for eleven years, and then I came back. I got married here and had four kids. Oh, so we only met three? Three kids live here and one lives in Haifa with his three children, he’s a chef there. Ah, so food runs in the family! Were you born in Yerucham? I was born in Tel Aviv, and moved here when I was two. It was fun because it was a much smaller place…we didn’t have computers or television, so we invented our own games. And in the evenings all the kids would go down and play together. I remember it very fondly. How has Yerucham changed from the time you arrived until now? Oh there’s been a lot of change…with technology. It’s changed this place just like it’s changed the rest of the world. The town has grown a lot. In the beginning, it was settled by Romanians, Indians, Persians, and some Moroccans. And with time, more Moroccans came, along with Russians. The education system here has also developed, now we have a lot of stores…it’s completely different. It transformed from a town of one or two thousand people to a town of about ten thousand today. Do you think it has been a positive change? Yes, very positive. There are a lot of great things in Yerucham, the culture for instance. There are a lot of plays here; the evenings are really interesting…there are social evenings…evenings where we sing here in the café, and a lot of culture in the religious communities here. 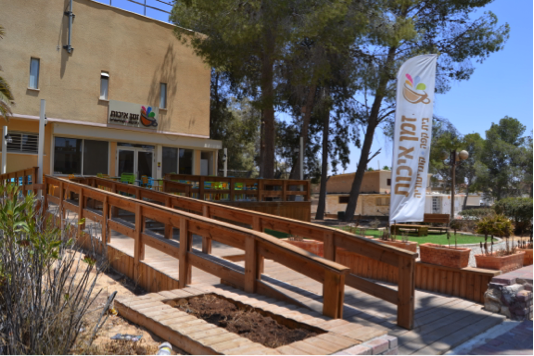 There are a lot of groups in Yerucham that have made it a much better place and have enriched the culture in the town. There are financial scholarships for students who can’t afford to study, as well as electives that are offered. How long did the process of opening the café take you, and how long has it been open? Also, why did you choose a café and patisserie? Growing up in Yerucham, there wasn’t a coffee house here. There wasn’t anywhere to sit and go out with your husband or children, for a drink. So I thought to myself, if I have enough money one day, I want to open a café. So it was your dream! Yes, it was my dream. I left Yerucham, I came back, and I started learning how to open my own business. By the second course meeting, I knew I was going to achieve my dream. At the end of the course, I met our mayor, and he said to me: “listen, there are two investors coming to Yerucham who invest a lot of money in the local business here. Meet with them.” So I met with them and I told them about my place here, and they really liked it. They told me that when they came to Yerucham for meetings, they had no place to sit down together. Now, they’re my business partners, and we took a whole year together to establish the business—to get all the approvals and certifications necessary for opening. Now, we’ve been open for eight months. How did the Yerucham community receive the café? There’s a problem here in Yerucham. There’s no “going out” culture. Even now, after over half a year, people still don’t come that often, they’re still not used to the fact that there’s a place like this. How do you view your role in the community? 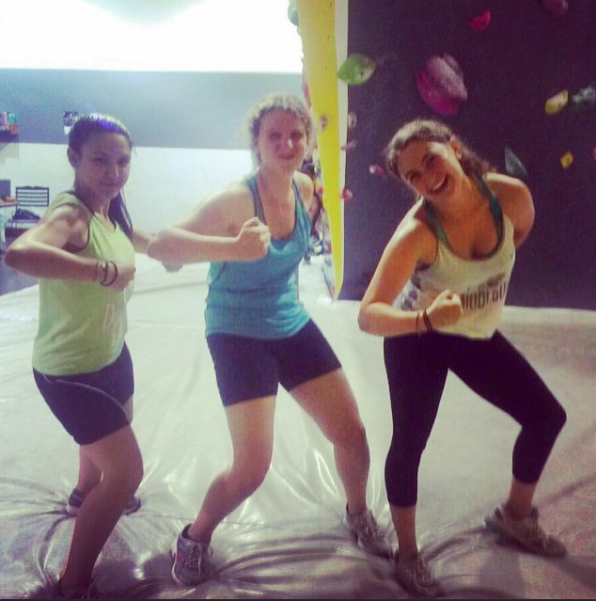 Firstly, as a business owner, I see myself as a contributor to the community. The youth that work with me are very important to me—they come from hard family backgrounds. It’s important to me that when people come here, they feel at home, that this be a communal place. More than just a business…it should be a meeting place for residents of the town to come and see other locals who they haven’t seen all day. It’s really important regarding the subject. How would you describe life in Yerucham these days? Really good…much better than in the past. Much more comfortable. When you come from a city to here, you feel a change. There you’re chasing after time; here you have much more time. 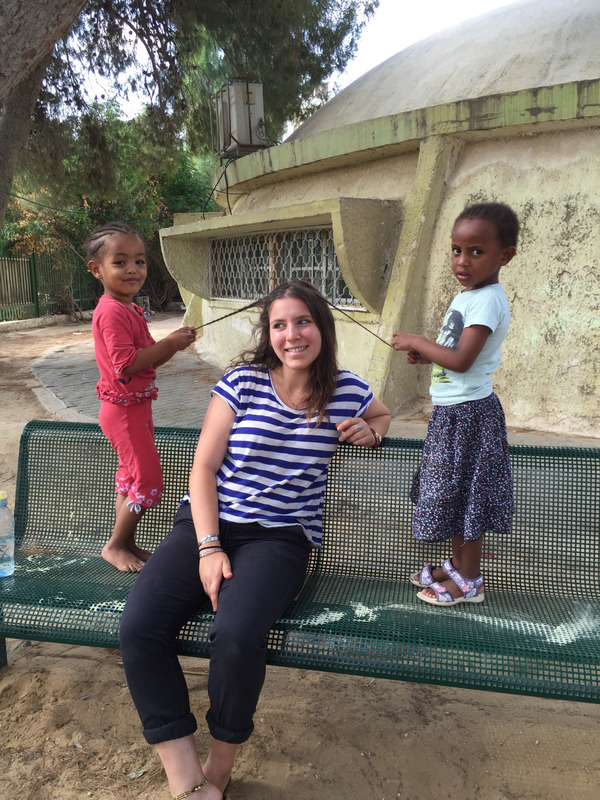 When I came back to Yerucham, I discovered that there were many new types of people here. Professors, doctors, lawyers…all of them did a lot of good for Yerucham. Because when they came, they enriched the culture here. Life isn’t simple, but it’s much better than it was. We’ve heard a lot about the role of Yerucham in the larger picture of Israel, as an immigrant town…how do you view Yerucham in this context and what do you think about it? Look, there are a lot of small places in Israel like Yerucham. Places like this are like settlement communities (moshavim) and kibbutzim. Everyone knows each other, and when this is the case, life is much easier. For instance, when someone dies in Yerucham, everyone comes, everyone brings food to the home of the mourners, and everyone visits. When there’s a wedding, there’s no one to be found in Yerucham because everyone has gone to the wedding. It’s like a small community. Yerucham is a very warm place. If you were to knock on someone’s door and say that you were hungry, even if they don’t know you, they’d set the table. Do you think the culture of Yerucham could represent the culture of Israel on a microcosmic level? When we were in Dimona yesterday, I went to a shop to buy a bottle of water. The woman behind the counter was busy, so an older lady sitting at a table instructed me to put the money down on the counter, and she’d explain to the owner that I had paid – not to worry, just to hurry back and catch my bus. This is the type of trust and familial culture that, as an American, I feel very strongly when I’m in Israel. Yeah…there are bigger places and smaller places. For example, in Tel Aviv, you go about your life…each person occupied with his own business, and you barely know your own neighbors. When I was living in Rehovot, I barely knew my neighbors. There isn’t that culture of knocking on your neighbors’ doors and being welcomed inside. Here, everyone cares for each other, everyone sits together at night, and we do communal evenings together. Last week, I saw on Facebook that the neighborhood went out together, in light of the situation, the war. They decided to have a day of relaxation and fun in order to lift their spirits, as things are very heavy-hearted right now. They put on a barbeque, made some salads, and set up tables – a lot people showed up from throughout the neighborhood. These are things that don’t happen in Tel Aviv, or other larger cities. In places like that, because population is bigger, the culture is different – completely different. What’s this time like for you – in terms of the operation and war? Very, very hard. First, we hear news of soldiers being killed. Yesterday, we lost ten soldiers. Something like fifty soldiers have been killed since the beginning of this operation. It’s very, very hard. You can also see it here [in Yerucham]. Not as many people come to the café because it’s hard. You could say that they feel crushed. It’s not simple to be in a situation like this, firstly because this is the situation of our state, but also because we feel like the world doesn’t understand us. We read all kinds of responses and see how people are talking about Israel, and that hurts our hearts even more, because it’s not a simple situation. We’re fighting for our lives and you could say, on the other side of things, that I’m sad for the people of Gaza – not for Hamas – but for the people who are living there, the civilians. They have a very hard situation there. Hamas controls them. They’ve simply taken them hostage – so it’s very hard, because we’re thinking of all our soldiers and what’s going on in our land. We’re fighting soldier to soldier and for our small land, so it causes stormy feelings. Your head doesn’t work like it’s supposed to [in times like these]. Yes, we have a strong army. I feel totally safe in Israel. I’m a business owner, and right now it affects people’s every day. They don’t have the strength or will to come sit and drink a coffee. They’re all watching their televisions every minute, every second. I’m here in the kitchen, and every moment I run to the computer to check what’s happening on the internet – where there are sirens, what’s going on with our soldiers, if everything is okay or not. This very much influences our every day. As I told you, all of Israel is worried about them. We’re baking them cookies, preparing them meals and drinks, collecting underwear….and bringing [these items] to them. It’s not simple – it’s very hard. On one hand we want this to be over, but on the other hand, we want everything in Gaza to stop – so that they won’t have tunnels or rockets, and that we’ll be able to finally be at peace with them. I can tell you that when I was almost 16 or 17… [a solider who had come from the field in Gaza and who had a few hours off walk in with his family at this point during the interview. Hadara motions them to a table and continues…] all of Israel unites in times like these. Can you describe your part in supporting the soldiers? In general, I prepare cookies and cakes for the soldiers and send them. We baked 70 cakes this morning and will bake more this afternoon. Soldiers come here, some come after Shabbat and ask for tomatoes and cucumbers… So I welcome them into the kitchen, and make them a full meal. I can’t have a place like this and not help. The financial situation isn’t good because people don’t come, but on the other hand, I wouldn’t feel good in my heart if I didn’t give something to the soldiers. So right now, these are soldiers in uniform [Hadara motiones to a table nearby], so they don’t need to pay for their meals when they come in. This is the little bit that we can do for them. Starting around 1951, immigrants who made Aliyah from a range of countries, including Morocco, Iran, Tunisia, and Romania, arranged with authorities and were guaranteed places in Jerusalem or Tel Aviv. Overcome with excitement upon their arrival in Israel, immigrants boarded buses that were supposed to take them to their new homes. Unbeknownst to them, the buses were in fact headed to Yerucham as part of a government attempt to begin settling areas of the Negev desert region. When they awoke in the mornings, expecting that they had been dropped off in Jerusalem or Tel Aviv, the settlers found themselves in a barely developed town in the middle of nowhere.